It's amazing that The Conjuring 2, which scared up an impressive $40.35M, is from Warner Bros., the same studio whose bloated DCU movies are causing all kinds of headaches. Once again it was James Wan shepherding another low-budget horror to the top of the charts, in a time when franchise sequels are getting hammered out there. 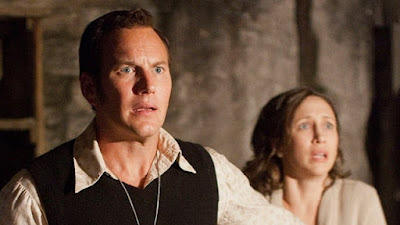 Perhaps studios ought to do a better job gauging audience interest, because clearly they wanted to see a sequel to 2013's The Conjuring, which earned $318M worldwide and was one of the best reviewed horrors in years. They loved it so much even the spinoff, Annabelle, racked up over $250M. That's the kind of audience loyalty modern genre films don't usually inspire, and you can bet they'll be catered to in a third film at some point. Already an Annabelle sequel is on the way, as well. There may be some mixed emotions over at the Legendary/Universal camp over Duncan Jones' Warcraft. The big screen, big $160M-budgeted video game adaptation opened with a meager $24.3M domestically, but it scored a thunderous $276M across the rest of the world. That greases a lot of wheels and may be enough to warrant a sequel to the blockbuster film, which has been torn apart by critics and compared unfavorably to Peter Jackson's Lord of the Rings. China powered more than 60% of the film's final numbers, surpassing Furious 7 as the widest opening film ever in their history. For context, the roughly $160M+ it earned in China is more than both Iron Man 3 (which you'll recall was a Chinese co-production catered to them) and Star Wars: The Force Awakens. And yet we don't give a crap about it here which is sorta wild. Original films are such a rarity nowadays that the $350M success of Now You See Me three years ago came out of nowhere. The star-studded film about a team of magicians who moonlight as thieving do-gooders was obviously going to spawn a sequel, but did audiences REALLY want it? Turns out they did because Now You See Me 2 opened with a solid $23M domestically, with another $22.8M overseas. There were a few added bells and whistles this time, which audiences seem to have appreciated. The original cast is back minus Isla Fisher who was replaced by Lizzy Caplan, plus Daniel Radcliffe was added in as the villain. And don't be surprised if Taiwanese superstar Jay Chou helps ratchet up the numbers in China. The budget is up a bit more, totalling around $90M (up from $75M last time), and as long as they keep that number modest there's no reason why more of these films won't be pulled out of a hat in a couple years. The TMNT sequel (I'm not typing that title out again!) dropped 58% for a $14.8M second weekend. That's actually not too bad, but considering the weaker than expected debut the overall numbers still aren't very good. Enough to justify a third movie? Probably not, but stranger things have happened and those Turtles are resilient. The latest illness weeper Me Before You slid 51% for a $36M total after two weeks. So much for any hopes this would be a Fault In Our Stars-style breakout, but then it didn't really need to be.